Nihayatul Wafiroh, 33, granddaughter of a popular Islamic boarding school founder in Banyuwangi, East Java, had turned down offers from political parties to contest past elections. This year she relented and agreed to run for next year’s general election. The researcher and consultant, who will represent the National Awakening Party (PKB) for the East Java electoral district covering Situbondo, Bondowoso and Banyuwangi, said that she was once apathetic to politics. Coming from a family of Islamic clerics that runs the Darussalam Islamic boarding school founded by Mukhtar Syafa’at, the biggest in Banyuwangi with around 4,000 to 5,000 students and alumni, some political parties see her as an asset, she said. She is also the first woman from her family to earn her Masters in the US (for Asian studies) and the first to pursue doctoral studies. PKB had been trying to persuade her for the last two years and she constantly refused until late last year. What changed her mind? “Last year I conducted research for Search for Common Ground [an international conflict and peace-building NGO] and interviewed female legislators […] I traveled to Yogyakarta, Kendari and many other cities. The quality of a lot of the female legislators that I interviewed was very low,” she said. “In NTB [West Nusa Tenggara] a female legislator was very shy just talking to me! Who am I? Imagine her having to talk and debate in the council or with her party members that are mostly men,” she said over the phone. Indonesia is gearing up for the 2014 legislative election scheduled a year from now on April 9, 2014. Based on the latest amendment to the law on political parties, aimed to increase female representation in politics, the General Elections Commission (KPU) last month ruled that parties not meeting the 30–percent quota for female candidates would be disqualified from districts where they failed to meet the requisite number. Nihayatul agreed to run on one condition — that her name should be on the party’s top list. “At least I should be number two on the ballot,” she said. In the last election of 2009, and in 2004 after the law first mentioned the quota for women candidates for legislative bodies, many female candidates were among those who failed to be elected. While observers pointed to the fact that many were not popular, advocates for women also decried the practice of political parties of assigning them low numbers on the ballot, thus reducing their chances of people voting for them. The number on a ballot still determines a candidate’s chance to win a seat in the House of Representatives, while the number of votes designates their fate on the local legislative councils. The question of quantity over quality became the hot topic raised by some political parties facing difficulties in reaching the quota. A number of parties have questioned KPU’s disqualification threat, arguing that parties would simply meet the quota irrespective of the quality of candidates. Activists have pointed out that political parties have had 10 years to prepare female cadres since the 2003 law on parties stated they “can” recruit 30 percent of women among their legislative candidates. An NGO focusing on elections, Cetro, produced a book profiling 100 potential women interested in running for the 2004 elections. Cetro pointed out that many women were ready, as long as there was sufficient support from their families, communities and political parties, apart from national affirmative action policies. Nihayatul’s political calling came from her personal experience that made her see the need for qualified female legislators. But many are still reluctant. A council member from Pasuruan, East Java, Rias Nawang Kartika of the Indonesian Democratic Party of Struggle (PDI-P) said that she would not run again for next year’s election. “That’s enough for me. I’d like to focus on my business,” the 51-year-old said. Her sister, who heads the regental branch of the Pasuruan Democratic Party, Evi Zainal Abidin, is applying as national legislator, only after being persuaded by many people, Rias said. Political parties’ functionaries say there is a lack of interest in women to enter politics. “Many are reluctant, they think about their family, especially their children,” said PKS spokesman Mardani Ali Sera. The Indonesia Democratic Party of Struggle (PDI-P) head of cadre recruitment and selection, Idham Samawi, echoed the sentiment. “Unfortunately, women are raised with the idea that they are konco wingking, confined only to housekeeping activities. We are trying to challenge this idea […] We have created special activities in which we want to convince women that they have the same opportunities and capabilities that men have,” he said. Idham admits that there are more male party members than females, but added that PDI-P has numerous female cadres that have become regents and deputy governors. “Bantul regency, Yogyakarta, the place where I come from, has more than 30 percent female legislative candidates who are qualified,” he said. 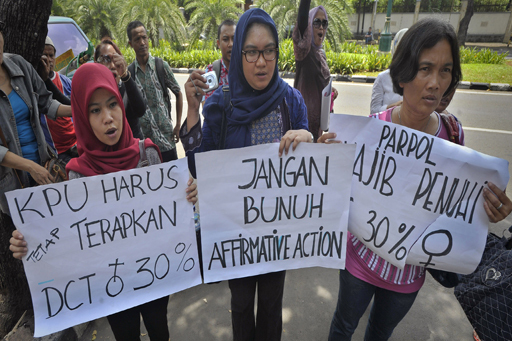 PKS has also reached the quota, Mardani said. He said women make up some 37 percent of 15,462 candidates for national and regional legislators that the party plans to submit for the preliminary candidate list. The head of the candidate selection task force of the Democratic Party, Suaidi Marasabessy, said last week that the party has exceeded the quota in total numbers, but not in some electoral districts. “If there are still some districts that have yet to reach the quota, we’ll move the candidates around,” he said on Wednesday. Both the Democratic Party and Great Indonesia Movement Party (Gerindra) said they are finding it difficult to reach the quota in rural electoral districts such as North Maluku. The country has seen a gradual increase in female representation in parliament, but the percentage is still far from the 30-percent quota first introduced a decade ago in the law on political parties. The 2009 election brought 101 female legislators to the national parliament, or 18.04 percent of the total 560 seats. The 2004 election brought in 61 female legislators or 11.5 percent of the total number of legislators. Meanwhile, the 2009 election brought an average percentage of female representation to 16 percent at the provincial level and 12 percent at the regency and municipality levels.